The Eppendorf Centrifuge 5430R provides reliable cooling and flexible spinning for your temperature sensitive samples. This benchtop centrifuge is simple to operate with a menu driven, back lit display and low access height for simple loading and unloading of samples and rotors. The microprocessor control of this microcentrifuge holds up to 50 user defined programs, with 5 quick access keys at the control panel for programs that are used often to help speed your work flow. The 5430R is flexible in the array of rotors that are compatible from Eppendorf, and with automatic recognition and imbalance detection your components are protected. The Eppendorf 5430R Refrigerated Centrifuge features speed programmable short spins for more fragile tubes or delicate samples, and includes a soft break to glide those delicate samples to a stop. This refrigerated microcentrifuge helps save energy as well with an ECO shut off, that will power down the system after 8 hours of non use. At the end of a run, this refrigerated centrifuge will sound an alert while a continuous cooling function will maintain the temperature until you disengage. The pre cool feature of the 5430R will quickly ramp temperatures down inside the chamber and can be programmed to activate by time and day. The temperature range of this benchtop centrifuge is between -11 to 40°C and the speed tops out at 17500 RPM, rotor dependent. 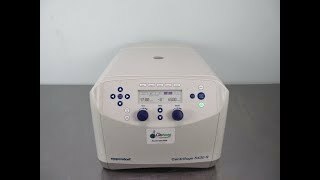 This Eppendorf Centrifuge 5430R has been fully inspected and is operating without issue. All of our lab equipment comes backed with our standard warranty. Should you have any questions, please don't hesitate to contact us.